nted Myanmar migrant workers returned home from Thailand in the past five months, according to a release of Myanmar's Home Ministry Monday. The migrant workers, who returned during the period between June 29 and Dec. 3, include 66,980 women workers. Undocumented Myanmar migrant workers have been returning home since the end of June although Thai authorities have delayed the full enforcement of a new labour law introduced in late June. 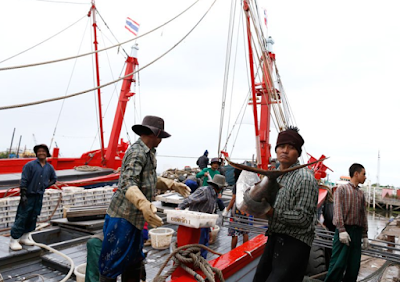 The law originally aimed at tackling human trafficking and regulating foreign workers in Thailand but sparked panic and prompted more than 60,000 foreign workers to leave the country then, many of them from Myanmar, Laos and Cambodia. The influx has overtaxed social agencies and border crossing as border gates restricted the number of crossing to only 100 people a day, causing hardship for many Myanmar migrants to have enough food and lodging while waiting for the border crossing, reports said. The new decree in Thailand imposes heavy fine on employers and employees who do not have work permits. About 4 million legal and 1 million illegal Myanmar workers are reportedly staying in Thailand. In a bid to solve the problem of undocumented Myanmar migrant workers who are returning home out of fear of the new labour law, authorities of the two countries negotiated on issuing official documents to the workers, the authorities said.